Gary Schmidt, You are an Ironman! Somewhere during the course of the marathon I stopped referring to Ironman Arizona as my first and started calling it my only (We’ll see…). As so many people do, I found myself in the “dark place” and was hating what I was doing. I wanted to be done. Why would I do such a thing? I just wanted to stop moving. 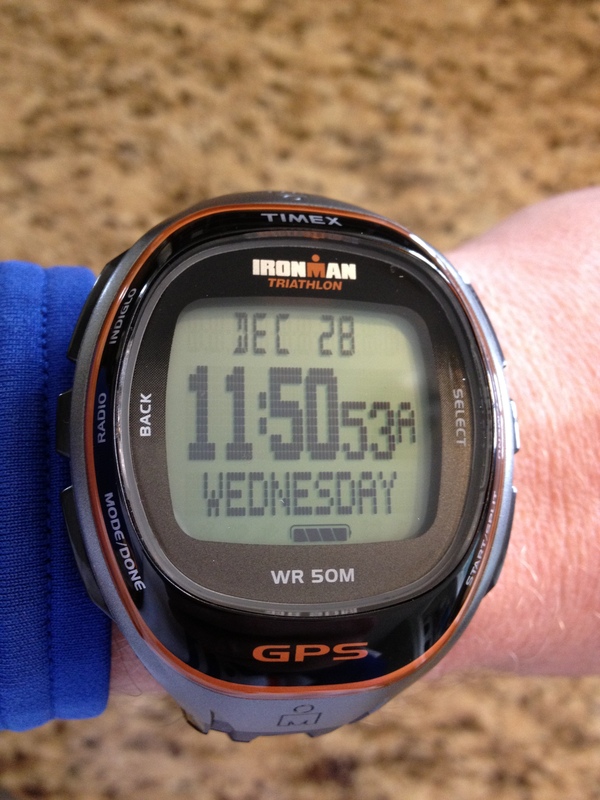 FYI… Ironman is hard. Harder than I thought. I had always thought that if I couldn’t run, at least I’d be able to walk. Well, when walking hurts more than running, you find yourself in quite a pickle. Oh, and one other thing… never, NEVER, think “I got this, no problem.” Cause before you know it, you will be on the pavement bleeding and lucky not to be in an ambulance. The canon signals the start of Ironman Arizona. I started towards the middle and the back of the pack. My goal was to remain calm and just take it easy. I knew – or at least hoped – that I would be far more nervous signing up for this race a year ago than I would be waiting in that 63* water for the start of the race, and I was right. I was remarkably calm. With my full wetsuit, neoprene cap and booties, the water felt comfortable to me and I had no problems breathing and taking it easy. The IMAZ swim course is not straight and you swim out towards the rising Arizona sun. This made sighting a little bit of a challenge. I swam right in line with the buoys or even to the inside of them and just plugged along. There definitely was some contact, especially under the bridge and at the turns, but it wasn’t terrible. The worst part of the swim was that my legs started cramping. Any time I really needed to kick, one of them would cramp up. I knew this would affect me later in the day and (spoiler alert) it did. Aside from the cramps, I had a good swim. My split was 1:24:03. Not fast by swimming standards, but for me this was solid. A sign of how well I did in a triathlon swim is how much breast stroke I did and during this swim, I did very little. The time spent sweating in my wetsuit at my local YMCA pool working on sighting did the trick. I was a little dizzy and out of it when I got out of the water and given the cramps there was no telling what my blood glucose would be… 99. Well, that’ll work. I had been running low all night before the race, so I was concerned how I would do in the swim. 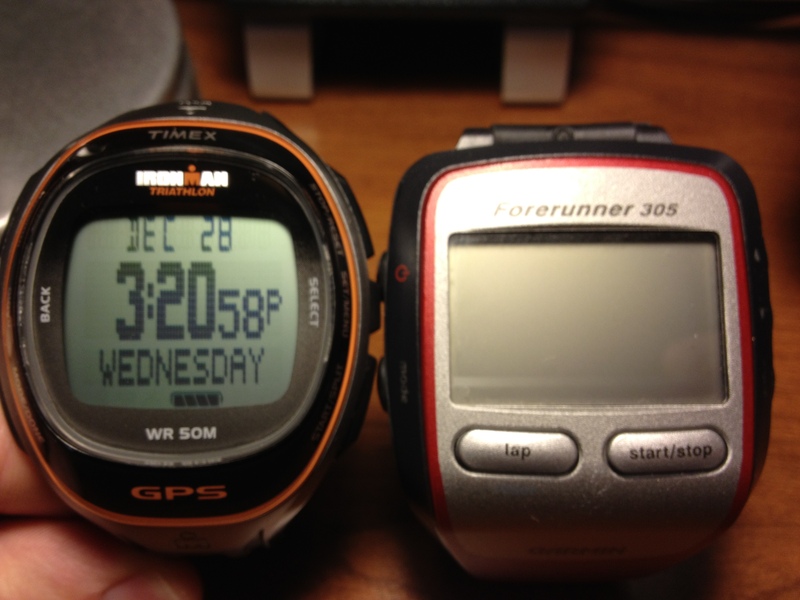 I was around 65 when I woke up and cut some off my planned bolus for breakfast. By 6:30, I was comfortably up around 200. I ate one GU before the start without a bolus and unhooked my pump for the swim. I nearly dropped too far, but it worked out and I was good to go. After testing 99 and just about to head off on a 112 mile ride followed by a marathon, I did something crazy… a 5.8 unit insulin shot. 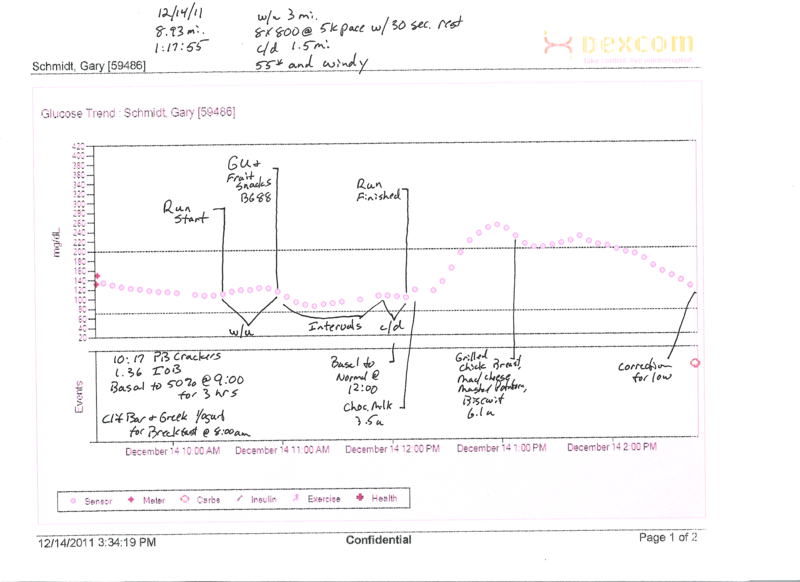 I was following an insulin plan from THE MAN Cliff Scherb which included a shot in transition 1 followed by decreased basal rates through the day. The plan worked perfectly and Type 1 Diabetes was barely a factor in my day. Off on the bike. I instantly felt the affects of the leg cramps. My calves were tight and never fully loosened up. I just couldn’t get comfortable. The bike course at IMAZ is a 3 loop out and back course. It’s a long gradual up hill on the way out and a long gradual downhill on the way back. On the first lap the light wind was in my face and made for slow going. It changed around for the last two laps, but wasn’t bad at all. Flat courses always sound good, but it means you will be PEDALING. No coasting here. So, there I am cruising along on my second lap out to the turn around. I had a decent swim and with my projected bike time, I’ll have no problem getting under my 14 hour goal. “I got this, no problem”. I had just stared in on a Powerbar and was sitting up with my right-hand on the horn and took a bite. The next thing I know, I hit a road reflector (they stick up about an inch and run along the white and yellow lines). I remember seeing my front wheel go 90 degrees and bam! I was on the ground. Oh. My. God. Did that just happen? It’s amazing how quickly you can go from riding a bike to being on the pavement. I took stock of my injuries. A scrape on the palm of my hand left hand. Scrapes and cuts on my left forearm including a dime size… let’s call it a… hole near my elbow. Oh my. Scrapes and cuts near my left knee. Bleeding, but not bad. I skidded on my pump, but it appeared to be fine. Dexcom was fine too. Didn’t hit my head and didn’t tear my shorts. Ok. The bike? I completely expected to see the front wheel bent, but it and everything else appeared perfectly ok. Back on the bike I went. I held my hand over the “hole” and it quickly clotted, so I was good to go there. Holy Hell. Did that really just happen? My day could’ve been over. DONE. Whew. This happened around mile 48. I missed the first aid at the 50-ish mile aid station, so I rode onto the turn around (mile 55 or so) and stopped and had an EMT – who happened to have Type 1 Diabetes – wrap my left forearm. Strangely enough I felt better after the wreck than I did before and now I was even more determined to push on and finish this thing. My bike split was 6:41:02. I expected to be a bit faster, but given the nature of the course and the fact that I freakin’ wrecked(!) the time was fine and still gave me plenty of time to finish and possibly still get under 14 hours. I got through the bike-to-run transition quickly and headed out for the marathon. 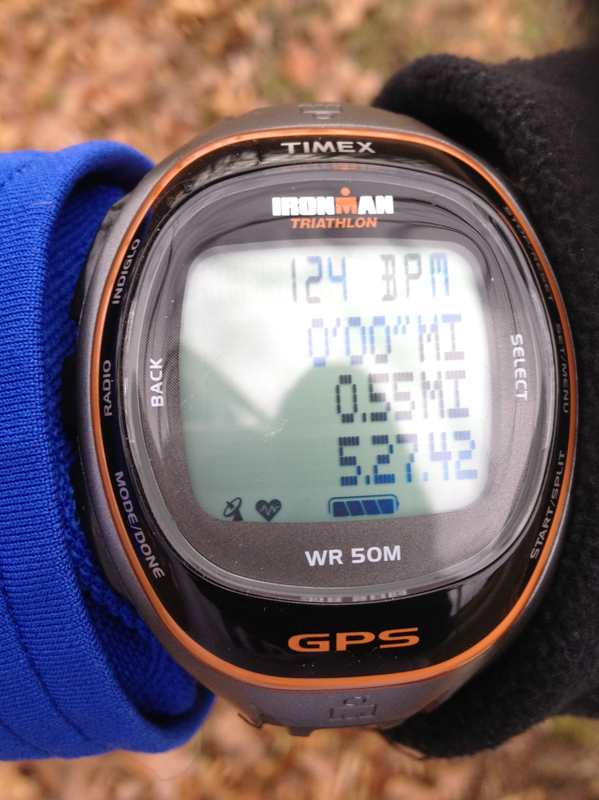 I felt good initially and was running right at my normal easy pace (a little under 10:00/mile), but I quickly realized that it was far more painful to walk than it was to run. This was going to be a problem. You always think during these types of events that if all else fails, I’ll just be able to walk. Now, I wasn’t sure if I’d be able to do that. The leg cramps during the swim were seriously affecting me now. The run course consists of three 8.7 mile loops around Tempe Town Lake. I was able to run most of the first lap. When I stopped at the aid stations, it hurt to walk. My calves were painfully tight and made walking difficult. The second lap had about half and half running and walking and soon I realized that I would be faced with a 8.7 mile walk to the finish. Hello “dark place”. Once I passed the finish area and saw Mindy and all of the awesome Insulindependence support crew I headed off for what would be a very long walk. I’m not a speed walker, so figuring out how to walk quickly and keep moving was not easy. 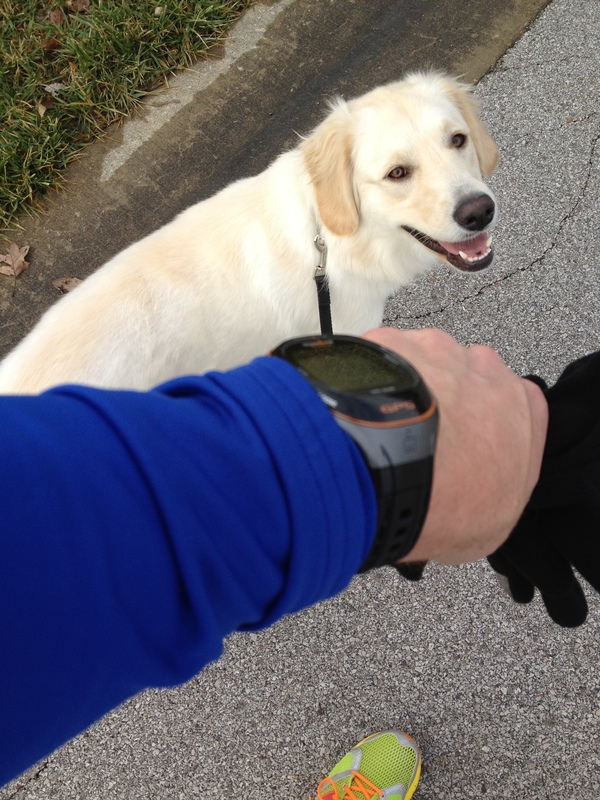 I found that I could keep up a 15:00/mile pace if I really tried. This is the point, where I just wanted to stop. Seriously. All I wanted to do was stop moving. This is where the mental side takes over and you just keep going. Do. Not. Stop. At a little after 9:15 pm, I made the final turn onto Rio Salado Parkway to head to the finish. I managed to see Mindy (I have a bad history of this) and high-fived the IN group and others in the crowd and heard those amazing words – “You are an Ironman”. I battled leg cramps during the swim. I wrecked my bike. I could barely walk the marathon, but I did it. I am an Ironman. 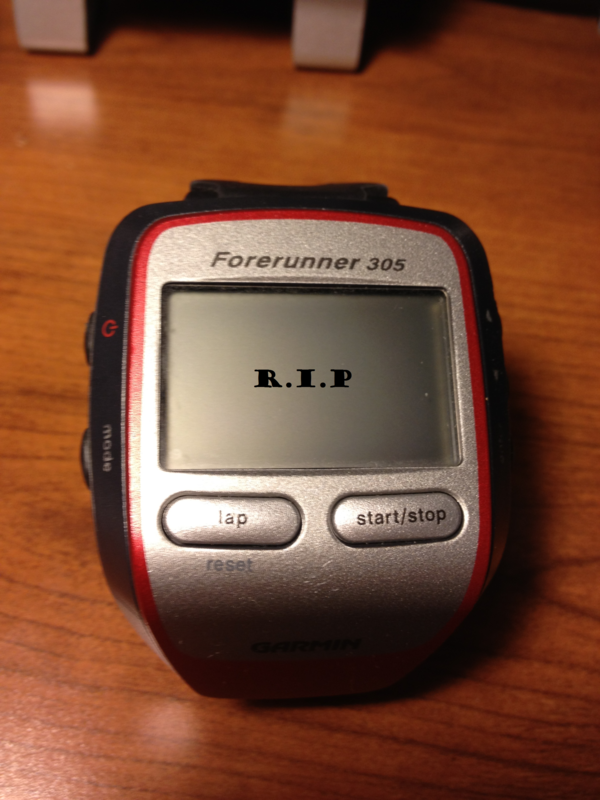 So, I’m trying to get serious about this whole thing and actually review my Dexcom data after runs. Here’s a look at everything required to review all the data from a run at some point in the future to try and identify trends. Quite a bit going on, eh? I had always been on the fence about doing a full Ironman. I respect the amount of time it takes to train and how that affects my family. I even wrote about it here just over a year ago – “IM or Maybe Not”. Earlier this year I started to consider doing a non-WTC event, specifically Rev3 – Cedar Point, but for whatever reason, and almost any triathlete can understand this, hearing the words “Gary Schmidt, you are an Ironman” for my first (maybe only) full 140.6 mile Iron-distance race means something. It’s silly, but it’s important… to me. Now, let’s go back to July of this year. I was talking about this with my wife, Mindy. We talked about Rev3 and also about IM Arizona and the words “I think you should do Ironman Arizona” came out of her mouth. That’s all it took to really convince me. Today the journey to Ironman officially begins. The general entry spots for IMAZ sold out online in 10 minutes. I was a nervous wreck this morning and as 12:00 pm Tempe, AZ time rolled around I’m lucky I didn’t spontaneously combust. I’ve even had dreams about having problems registering. Just awful. I’m sure that I will be a million times more calm while I’m treading water in Tempe Town Lake next November 18th. I got right in at noon and after 3 minutes of nervous typing (and answering a lot of questions with “na”) I’m registered for IMAZ.